Yesterday I was talking to a local retired civil servant who had come to take one of my fellow hotel guests sightseeing on the other side of the island. He now lives off his pension and enjoys doing part time work in hotels to keep himself occupied. He told me that the grand 75 year old hotel he has been working in most recently is shutting down for good next week. The building is too big and neglected to be viable as a hotel without major investment. He said there were no plans for the building but was confident that heritage laws would protect it from demolition. When I talked to him about my hotel – Hutton Lodge - he mentioned that there had been an attempt a few years ago to burn it down for the insurance windfall. The hotel is one of George Town’s few remaining colonial style bungalows. Fortunately it has been restored and redecorated – simply - and is now quite profitable as budget accommodation. It has a breezy interior with original architectural features intact, and I would have no hesitation in staying here again if I returned to Penang. Later, I was thinking about urban regeneration as I walked along Armenian Street (Lebuh Armenian), which – like The Rocks in Sydney – is frequented mainly by tourists. It is very presentable, with even footpaths and restored and freshly painted buildings. The owner of the tiny café I visited said that nearly all his customers were tourists, whom he liked because they were polite and friendly. At the end of Armenian Street is the office building of George Town World Heritage Incorporated, an advisory resource that employs professionals with backgrounds in fields including urban planning, architecture, conservation and heritage. It is described as an independent company, although its Board of Directors is made up of government officials and politicians. Arguably that is how it should be. I would guess that the measure of their success will lie in how incorrupt they manage to be. There are exhibits on the ground floor depicting the types of architecture and methods of conservation. Its focus is more on preservation than urban regeneration, but I was thinking that the two need to go hand in hand if the result is to be a living city rather than merely a tourist attraction or a museum. I was reminded of an urban planning exhibition I visited when I was in Medellin, Colombia, in 2015. It was called ‘Piso Piloto. Medellin-Barcelona’ and was about renewing cities, specifically those two. The focus was on public housing, including both architecture, art and design, and the social dimension in particular. 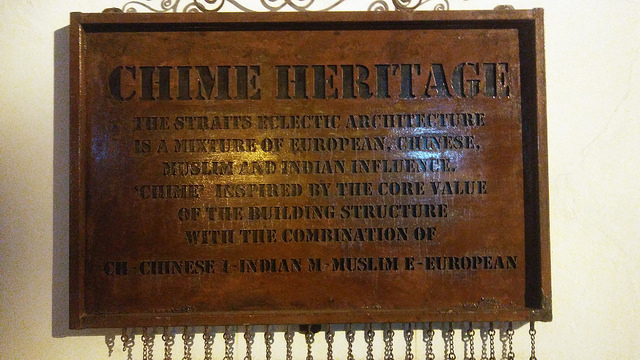 They did not use the word ‘heritage’. But importantly, for me, they had integrated an aspect of regeneration and renovation of existing spaces. In George Town, it seemed to me that it was all about preservation without a social dimension. That suggests that they need to work to ensure they do not end up with a large street museum rather than a living city that caters for the needs of its own population in addition to the desires of tourists. 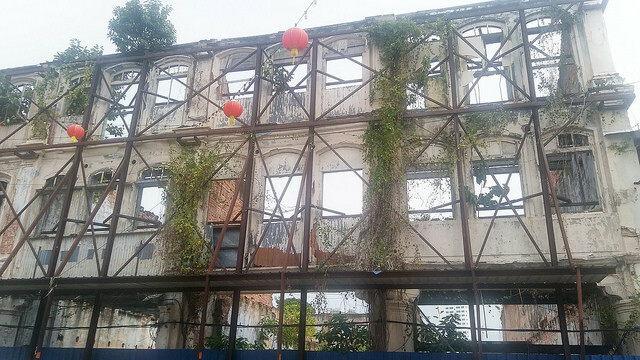 Should Penang sanitise its past? After taking an overnight flight from Sydney and transiting at Kuala Lumpur for four hours, I arrived in Penang at 8:00 am yesterday. I told the bus driver that I wanted to go to Penang. He obviously gets it regularly from tourists, but laughed and was intent on correcting me. I was already in Penang – the name of the island - and headed for George Town, the island’s city that is Malaysia’s second largest and one of Southeast Asia’s most famous cultural and gastronomic hubs. Within George Town, I am staying in a historic no frills bungalow hotel on the edge of the 108 hectare World Heritage zone, which was inscribed in 2008. UNESCO recognised the city for its 'unique architectural and cultural townscape without parallel anywhere in East and Southeast Asia'. George Town contains one of the largest collections of pre-World War II buildings in Southeast Asia and is considered an architectural treasure. That description leads me to expect the kind of picture perfect vistas that we associate with many urban precincts in Europe. But my first impression was that George Town is just as dilapidated and functional as Jakarta and Ho Chi Minh City and many of the other Asian cities I’ve visited, complete with the odours of an inadequate sewerage system. I enjoyed my day long ‘discovery walk’ along the broken and uneven and obstructed footpaths. There’s a lot to see, but what stood out for me was an attraction much less grand than most. It is the historic photographic display and memory collection point on the ground floor of the Star newspaper building. 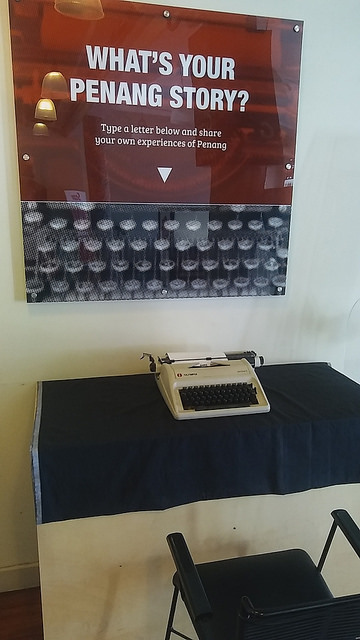 In particular I liked the ‘What’s your Penang story?’ corner where visitors were invited to type a letter to share their experience of Penang. I don’t know how many people have actually typed their story, but I appreciate the symbolism of publicly holding up the value of listening to and recording people’s stories. Until they see a display like this, many people think that nobody wants to know about their past. I’ve long been interested in ways of preserving the past, since I did my Applied History postgraduate degree at the UTS Sydney in the 1990s. Coincidentally, on Sunday I was talking to a member of an oral history collection group that had a stand at a fair in Newtown in Sydney. He is currently doing a postgrad degree in history at UTS. Understandably Penang will want to capitalise on its World Heritage site status. I noticed many of the hundreds of restaurants in the city use heritage as a selling point. 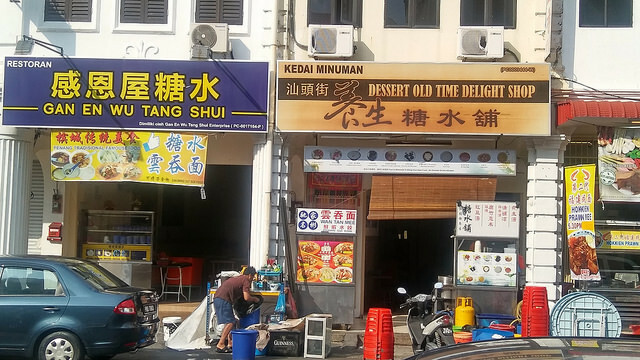 My photo depicts promotion of ‘Penang Tradisional Famouse Food’ and ‘Dessert Old Time Delight Shop’. I like this. But I suspect that commercial reality will probably see the transformation of the heritage zone into a sanitised theme park so that tourists will visit in large numbers and generate renewed wealth for the city. That will probably mean the creation of even footpaths and the elimination of sewerage odours. 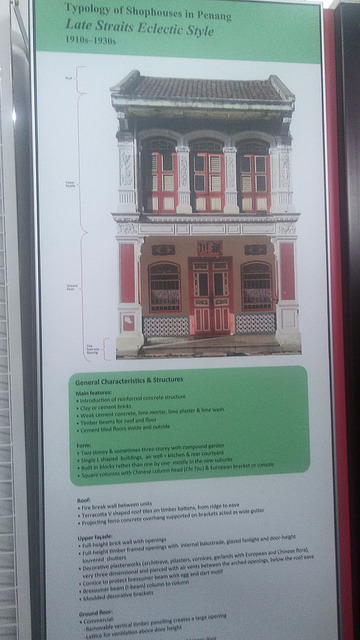 These enhancements will make for a more comfortable visitor experience, but I think it will also be a less authentic representation of Penang’s past. Last night we were having a conversation about naïve travellers. The kind of person who is not particularly seasoned as a traveller and doesn’t think much of the Australian Government travel warnings on the DFAT website. These people have the best time. They’re wide-eyed and fully immersed in the experience of discovering new and strange things. They’re not constantly on guard. They don’t miss out on experiences because they’re too busy exercising a high degree of caution. It is obvious that this type of traveller is statistically more likely to come to grief. It goes without saying that it is highly irresponsible of me to disparage the travel warnings. I am tempting fate and potentially leading others into danger. If DFAT says ‘don’t travel within 10 kilometres of the Iraq border’, I can accept that. But I will baulk at advice to stay away from political demonstrations. That’s where I’m likely to discover what really matters to the citizens of the country I’m visiting. I am thinking of a beautiful travel vignette I read a few months ago on the ABC Open website. It was from Oliver Jacques, a young Sydney writer who had been backpacking through Iran for three weeks. He speculates that DFAT must have a warning about handing over your wallet to strangers in developing countries. But he’s clearly glad that he didn’t follow it. What transpires is on one level just another of the dozens of intercultural exchanges you have every day when you visit these countries. But it was one of the most affecting travel stories I’d read in a long time. He took a calculated risk and was richly rewarded. Over the last few days I've been travelling in northern NSW and over the Queensland border by train and bus. I wanted to attend a funeral in Ballina and also visit my uncle and aunt on the Gold Coast hinterland. But I also liked the idea of travelling at a slower pace that allowed me to see more of the countryside and the towns and the people. I appreciate the stories that you hear from people in the country. This time there were two in particular that stayed with me. One was from my AirBNB host in Lismore and the other the waitress at Curry House restaurant in Casino. My AirBNB host welcomed me about 8:00 pm and invited me into her backyard for a BBQ sausage and a beer with her husband and her medium term boarder. She had a large vegetable garden and complained that her neighbour's goat would sometimes get into her garden and eat the plants. When she'd mention it to him, he would nonchalently reply that the goat must have been hungry. My host was very patient with him because he was always very kind to her and to everybody else he'd come across. He drove a taxi, and one night picked up a woman living with mental illness who was estranged from her family. The woman said she didn't have anywhere to go, so he took her home to stay the night in his spare room. That was a year ago, and she's still there. 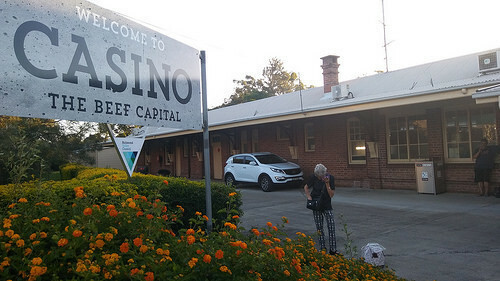 A few days later I found myself in Casino, which is as far as the north coast train goes, since former NSW Premier Bob Carr closed the service to Murwillumbah in 2004. I had a few hours to fill in because the train that connected with my bus from Robina was running late due to the heatwave. It had been 46 degrees earlier, but in the cool of the evening it was a more bearable 38 degrees. I'd enjoyed the curry I'd eaten in Lismore and was pleased to find a simple Indian restaurant in the main street the town. The waitress wasn't Indian, and she was just there helping out her friend the owner, who was. I was the only customer, and she sat down to talk with me while I waited for my beef korma (Casino calls itself the 'Beef Capital'). The heat was the main topic of conversation but she got around to telling me about the woman with a mental illness whom she'd taken in until the woman could find better permanent accommodation than the tent in the caravan park that the Salvos had provided. That was many months ago. My waitress's mother had passed away early last year and she had a spare room, and most likely the need for companionship. The woman with the mental illness was 'no trouble'. She would leave the house every day at 8:00 in the morning and return around 6:00, with her dog. But the dog was 15 and died of of old age some time after she moved in. My waitress told me that her boarder was distressed and didn't know what to do. So she took the initiative and went to Bunnings to buy a pot and some potting mix in which to give the dog a dignified burial. The woman was very grateful and now the pot with the dog's remains is her most treasured possession. 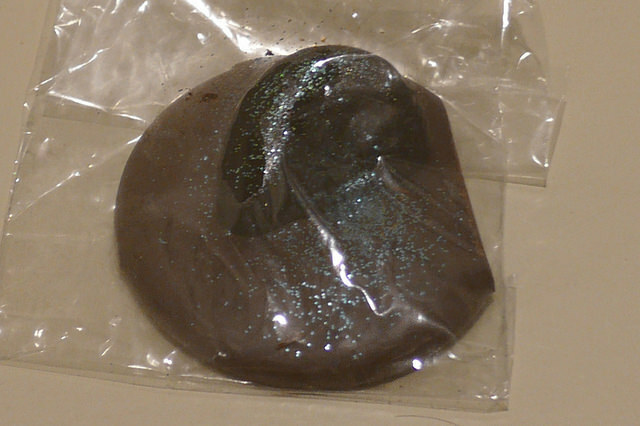 Last night it was three days since our return from New Zealand and we sought to relive the experience by sharing one of the two garlic chocolates we bought at the Ocho craft chocolate establishment in Dunedin. Ocho is short for 'Otago Chocolate'. The shop and factory is located in Dunedin's Warehouse Precinct, where the distinctive Dunedin buildings have been transformed from a near derelict state and been given a new lease of life. We discovered Ocho by accident, lured off the street by the coffee and chocolate aromas. We'd just passed on taking a tour of the huge Cadbury plant around the corner. It is a labour of love for the artist and former journalist Liz Rowe, who says she got side-tracked into making chocolate after spending six months in Latin America in 2011. I know what it's like to be seduced by chocolate as a traveller to those parts. When I was in Lima in 2015, I went to the Chocolate Museum for breakfast not once, but every morning during my three or four day stay. The displays put the lure of chocolate into the context of its science, history and labour relations. Later that year I couldn't believe it when my dietician actually encouraged me to eat chocolate - natural chocolate - and how serendipitous it was that the local health food shop had a large batch of Ecuadorian dark chocolate at a good price. I had that rapturous experience of something you've long regarded as sinful suddenly and unexpectedly being revealed as a virtue. While enjoying the garlic chocolate last night, we talked about how we might entice our garlic farmer friend from the NSW South Coast to get into the business of making garlic chocolate. Somehow I think she would be intrigued enough to give it some thought. After a Cadbury dairy milk chocolate upbringing, I became fascinated with the possibilities of creativity with chocolate after seeing the film Like Water for Chocolate in the 1990s. I had just discovered kangaroo meat and I attempted a chocolate kangaroo dish. It wasn't very successful but I didn't regret trying. I think I was attracted to eating kangaroo at that stage by the fact that it had just come on to the market for human consumption and was still regarded by most people as taboo. A decade or two earlier, the same could be said for eating garlic. I remember my mother telling me that it was anti-social to eat garlic. She said it was one of the things that distinguished European migrants from 'us', but it was something we'd have to learn to tolerate. In particular there was a Ukrainian man to whom we'd often give a lift who always reeked of garlic. Now we have learned not only to tolerate but to love and appreciate garlic, for both its taste and its health and cultural virtues. Likewise chocolate. No longer a sin but - in right measure - one of life's authentic peak experiences. For the past two or three years, I have fantasised about being out of the country for Anzac Day. It hasn't happened, and it won't happen this year. But yesterday I was really pleased to be in New Zealand for Australia Day. I woke up not thinking of Australia. We went out and had breakfast. 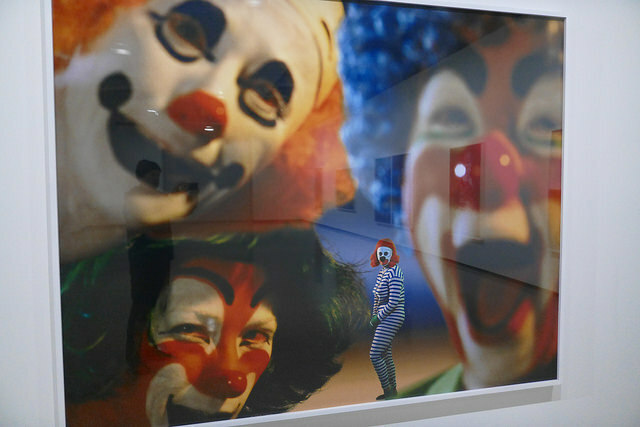 Then we took a short walk to the Wellington City Gallery, where we very much enjoyed the exhibition of the works of American 'selfie' photographer Cindi Sherman. In the afternoon I visited my uncle and my aunt - both facing the challenge of ageing. I was then taken out by my cousin, who was in good spirits and an excellent companion for the rest of my afternoon. In other words, I had a very happy Australia Day away from what I understand was the ugliness of the day at home. In itself my own protest, with Cindi Sherman's clowns providing a fitting backdrop. If I had been in Australia, my form of defiance would have been just as real, but very different, and a bit unusual. I would have attended an Australia Day citizenship ceremony. I contemplated doing that last year, did the research, but in the end indifference got the better of me. A citizenship ceremony would have allowed me to take part in the welcoming of 'new Australians' and to affirm my strong belief in a multicultural Australia. I would like it if Australia Day was all about the freshly minted new Australians. Not the (European) less new Australians like me, or even the (indigenous) old Australians. That is why I am happy to ignore what some of the vocal European and indigenous Australians want Australia Day to be about. I was proud to grow up in a community that included many people we called at the time 'new Australians' (the term was later dismissed because it was thought to conflict - I believe erroneously - with the idea of multiculturalism). It was in Albury-Wodonga, close to the Bonegilla migrant reception centre, which was still operating when I was a child. 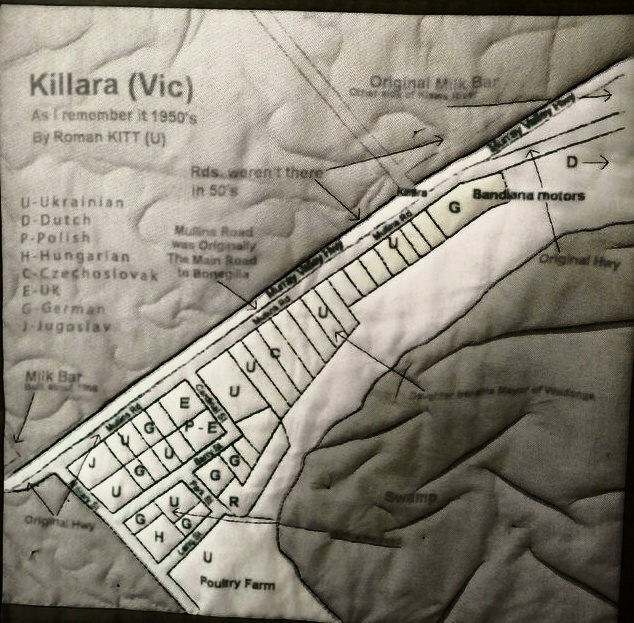 In 2015 I had a piece of art made to commemorate my family's personal connection to the new Australians from the Bonegilla centre (pictured). I also felt good that my 'family' at the dinner table this past Christmas Day was a group of six friends who were all new Australians. I was the only Australian born person at the table. In Sydney, I love getting the train to a suburb with a concentration of new Australians - walking around and enjoying the food. Recently I had a Persian meal in Auburn with a new Australian friend and her mother in law who was visiting from South Africa. I would like to think that New Zealand has it right and is able to avoid the ugly politics of nationalism when it celebrates its national day Waitangi Day in ten days time. But sadly my cousin tells me otherwise. Before visiting Barcelona at Christmas in 2015, I remember going to YouTube to watch the film Bye Bye Barcelona, which is a documentary about the negative effects of mass tourism on the people of the city. 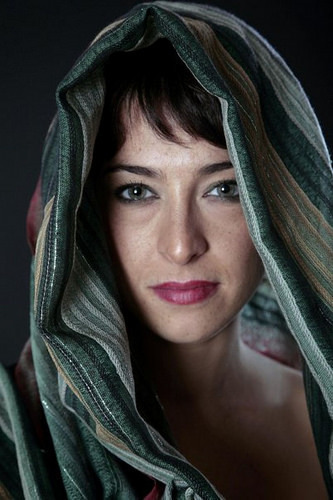 The film is made by a local artist who explores the fraught relationship between Barcelona as a living population and Barcelona as a tourist destination. He interviews fellow residents who complain that the city is becoming a theme park. One laments the city's 'loss of enchantment'. Part of me can't take these complaints too seriously, given that the people of Barcelona owe much of their relative prosperity to tourism. That's the main reason Barcelona's regional unemployment rate in 2014 was 19 per cent compared to the national figure of 24 per cent. Yesterday The Guardian published an article about tension between tourists and locals in New Zealand over access to public toilets. One North Island resident complained that 50 people each night used a toilet block that contained a single toilet. If the queues got too long, the tourists simply use the nearby bushes and contribute to the contamination of rivers and beaches. 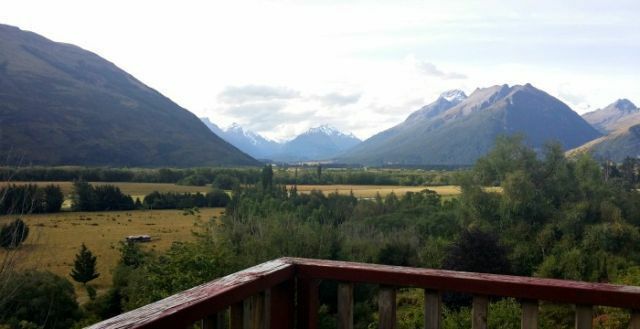 One of the towns mentioned in the article was Glenorchy, a tiny community of 363, an hour's drive to the west of Queenstown on the South Island. It is at the end of the road and the end of the lake that makes Queenstown such a scenic tourist destination. 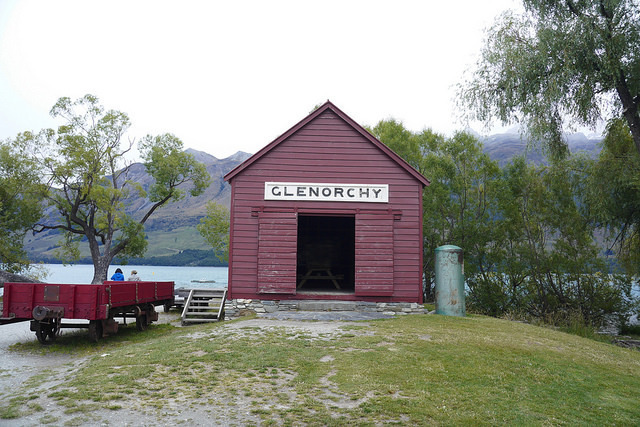 I have two images in my mind of our visit to Glenorchy. One was the thriving dumpling shop that was set up to profit from Chinese tourists. The other was a funeral procession, demonstrating that life in Glenorchy is not entirely about tourism, that there is a living community made up of real people. Queenstown has a picturesque lake and many adventure tourism assets. There are only 14,300 permanent residents. Our impression was that it was spoiled by the volume of tourists, and we drove straight through. It's clear that Queenstown's infrastructure can't sustain the tourist boom. The traffic on its congested main through road is slower than what you would expect in peak hour in major cities in more populated countries. But who wants a four lane highway replacing the existing two lane through road that winds around one side of the lake? Queenstown is just the first of many South Island towns to face an explosion in tourist numbers. On the other side of the mountain is Wanaka, another lakeside mountain resort town that is poised for similar development. I've heard that numbers developers have approvals in hand. 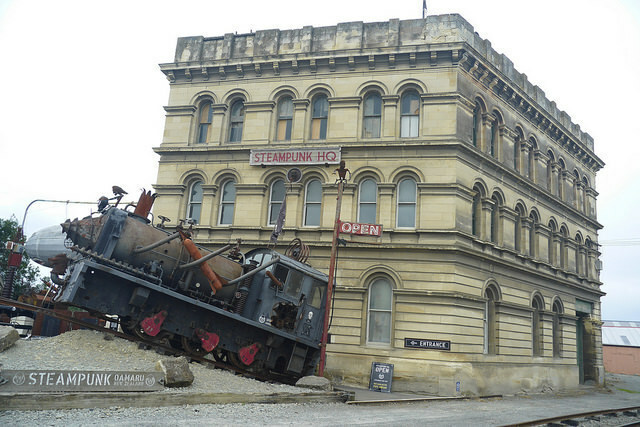 Meanwhile there is the quirky east coast town of Oamaru, with its many well-preserved Victorian buildings. It is made for tourism but - mercifully? - there are still relatively few tourists. On Tuesday afternoon, we visited 'Steam Punk HQ'. This is a collection of industrial sculptures and audio visual installations in darkened rooms that reflect what seemed like a particular local hobbyist's interpretation of the steampunk science fiction sub-genre. But it could have a big future as part of an Oamaru theme park. Within a year of its 2011 opening, TripAdvisor was rating it as one of New Zealand's best new tourist attractions. It fits with the town's Victorian era ambience, and is complemented by retail shops specialising in steampunk clothing and accessories. Numbers will swell suring the Steampunk NZ Festival Weekend at the beginning of June, but essentially it is fairly quiet for most of the time, for now. Some of the locals want it to stay quiet, according to my friend Nathalie, whom we visited there. But others realise that the industries that sustained Oamaru in the past have gone, and tourism is their big opportunity to return to prosperity. The choice may not be entirely theirs. The 2016 edition of Lonely Planet described Oamaru as 'New Zealand's coolest town'. I've always been interested in rivalries between cities. I grew up in Albury-Wodonga. Wodonga had long been considered poorer and less attractive. But for many years it has been growing faster than Albury and may one day overtake Albury in size and importance. In the eyes of many, the two cross border cities are regarded as one. But in recent years they've dismantled certain joint initiatives. They now promote themselves separately to tourists and potential new industries and settlers. Today we're travelling to Oamaru, which is a coastal city of 14,000 inhabitants. It is an hour an a half north of Dunedin, where we've stayed for the past two nights of our tour of part of New Zealand's South Island. 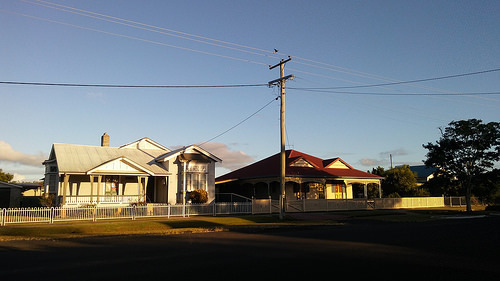 A further hour north on State Highway 1 is Timaru, with a population of 29,000. We were originally booked to stay there because it was more conveniently situated for our drive to Christchurch Airport on Wednesday. We switched because a few people said that Oamaru was by far the more beautiful of the two cities. These included our west coast B&B host Sue, and my friend and work colleague Nathalie, whom I'll see today for the first time in 26 years. Nathalie lives in Oamaru and told me that there is no question that Oamaru is more beautiful and has the best attractions. Of course she would say that. Our vegetarian AirBNB host on Friday and Saturday told us that both cities have their attractions. She said we should take what we hear from Timaru's detractors with a grain of salt because they are probably from Oamaru. As it happens, Timaru is in the Canterbury region, while Oamaru is in Otago. That suggests the rivalry between the two smaller cities is at least partly a reflection of the competition between Canterbury's principal city Christchurch and Otago's Dunedin. I have been interested in that since my uncle told me years ago that he had a soft spot for Dunedin but didn't think much of Christchurch. He's proud of his Irish-Catholic heritage and didn't waste any time telling me that the English had a stranglehold on Christchurch. 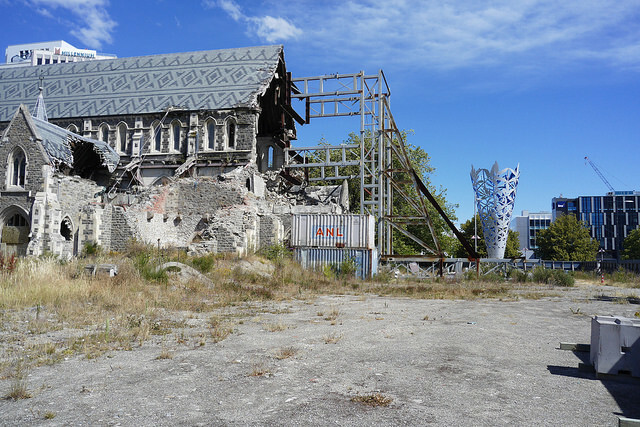 If you were a Catholic and wanted a decent job, you probably wouldn't find one in Christchurch. Dunedin was a different matter. With its Scottish roots, the people there were much more sympathetic to their fellow Gaelic cousins. He has lived in Wellington for many years, but was very happy to be living and working here in Dunedin while bringing up his family about 50 years ago. When I called him yesterday, he told me that his office was in the centre of town and that he had a pleasing view down on to the Octagon, which is the focal point of the city. I read that when the Octagon was first laid out in the original 1846 survey of the city, the English made covert plans to build their Anglican Cathedral right in the Centre of the Octagon. There was a furore when the predominantly Scottish Presbyterian local community found out, and St Paul's Anglican Cathedral was subsequently built, and still stands, at the edge of the Octagon. 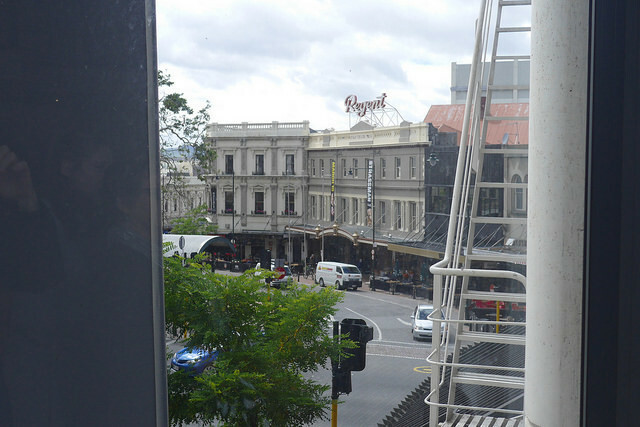 It was a different matter in Christchurch, which was conceived as the model English city. Its equivalent to the Octagon is named Cathedral Square after the Anglican ChristChurch Cathedral, which was built as its focal point, though it is barely standing today due to substantial earthquake damage. How to make sense of the beauty of nature on New Zealand's South Island. That is what I'm about at this moment, as I look through the window of our AirBNB accommodation bedroom at the clouds hanging over the snow capped mountains. I can admire the people here on the South Island. Especially their plucky approach to facing the challenges of the natural environment. The Christchurch and Kaikoura earthquakes of the last few years, and the 'weather bomb', as they call it, that has hit them in the past week, closing roads and disrupting lives. But its magnificence is another thing. Yesterday my travel companion Bernard had a word that described his experience of it. Rapture. I had a mixed reaction to that. What comes to mind is the end of times event from the Book of Revelation in the Bible. According to the prediction, Christian believers who have died will be raised to heaven and those still living will meet them in the clouds. That doesn't help much. This kind of thing is the preoccupation of those who belong to some very weird branches of Christianity. But it's a different story when I seek out its various dictionary meanings. A feeling of intense pleasure or joy. | A state of being carried away by overwhelming emotion. | A mystical experience in which the spirit is exalted to a knowledge of divine things. I wonder where Bernard got this word from. It turns out that it's from the Australian writer Robert Dessaix, describing his experience of the sublime in the highest mountain passes in the world, in northern India. 'All I can see is snow and rock. I am thrillingly unhoused, yet snug. I am nothing, I am the whole world. The desolation is complete, the rapture not just beyond words, but thought. This is what abandonment means.' (The Saturday Paper, 1 Nov 2014). 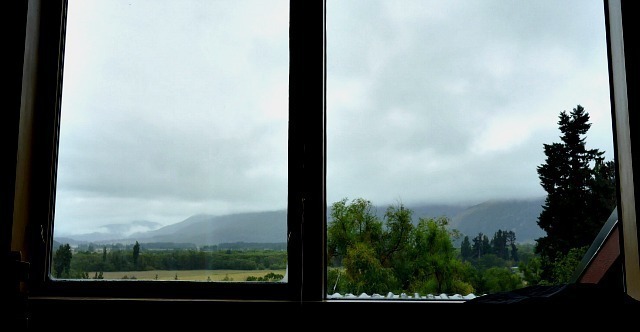 We stayed in Arthur's Pass last week, the day before it was hit by the 'weather bomb' and isolated from the rest of the world. Then on Friday we drove through Haast Pass on Friday, on a beautiful sunny summer's day. Were those experiences of the South Island mountain passes rapturous? Not exactly. But they do give me some understanding of what Dessaix is getting at. We all have our particular moments of rapture. Their intensity varies, but they are still rapture. 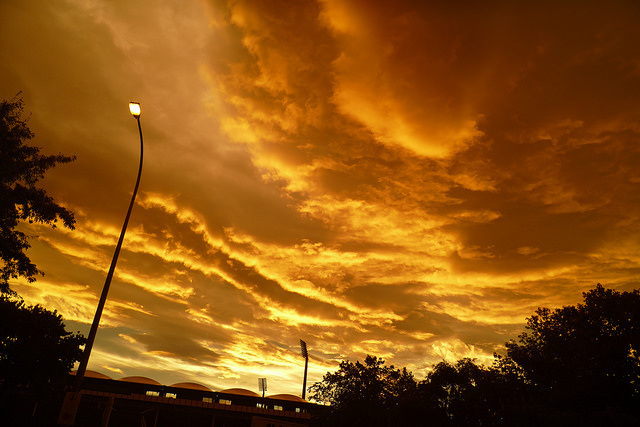 For me during this trip, it was the orange rain clouds at sunset in Christchurch on the night of our arrival (some would see an allusion to the end of times meaning in the Book of Revelation!). 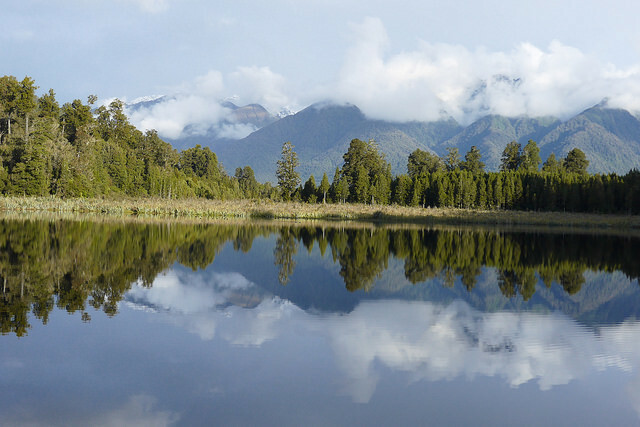 For Bernard, it was the mirror reflection on Lake Matheson near Fox Glacier on the West Coast. Being rapt is about being stopped in our tracks. Being suddenly able to see more than the mundane. A glimpse of what the divine is for us. Tomorrow we reach the half way point of our two weeks travel to parts of the New Zealand South Island and Wellington. My travelling companion likes to have an itinerary planned and transport and accommodation booked. I like to arrive in a country with my return air ticket and no more than the first night's accommodation secured. We've compromised and made advance bookings for about half the journey. Last night we were in a motel in Fox Glacier on the west coast. We had no bookings for the next couple of nights. Just the way I like it. We were not tied down and could do anything we wished (as long as all the viable accommodation options were not booked out). It was well into the evening and we didn't know where we were headed the next day. The word 'farmstay' came into one of our heads. That was an option neither of us had previously considered. We did a couple of searches and found a sheep station close to the geographical centre of the South Island. It looked good, until we read the user reviews on the accommodation booking website. It turned out that the owner was a redneck who would make judgmental comments about the life choices of his guests. He virtually told one young university student that his university course was useless. We looked elsewhere and came up with another possibility further south, with spectacular mountain views, where the owner was a strict vegetarian. With this choice, we would not have to face grilling from a redneck, and it's likely the values of the vegetarian would be much closer to our own. With AirBNB you need to message your potential host to persuade them that you are worthy to stay in their accommodation. I told our potential host that I liked it that she preferred vegetarians. That was true, but she took that to mean that we were vegetarians. 'Very nice to hear that you are vegetarian!' she wrote. Would we maintain the pretence that we were vegetarian when it wasn't true? Perhaps it would do no harm. Until we visited a salmon farm earlier in the day and could not resist buying two ultra fresh salmon fillets for dinner in the evening. When we arrived at our host's farm in possession of the fish, we had to confess that we admired vegetarians but were not actually vegetarians ourselves. We had to negotiate how we would cook our salmon fillets without offending the vegetarian sensibilities of her family. If we were to cook them. Initially she suggested freezing the fish and taking it with us when we leave. We agreed that would not work and she graciously organised an electric frying pan with an extension cord so that we could cook it well away from the house. She also set up a table and chairs outside for us to avoid us having to eat our non vegetarian meal on her family's vegetarian dinner table. The salmon was delicious but I did go to bed wondering if I would have preferred to be judged by a redneck rather than a strict vegetarian.